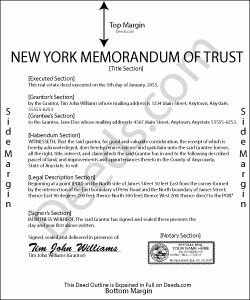 In New York, trustees of personal trusts use a memorandum of trust to certify the existence of a trust and their authority to act on behalf of the trust. The memorandum is used in place of the actual trust document and provides only essential information about the trust for lending institutions or other third parties. In this way, information that may be personal in nature, such as the designated beneficiaries under the trust, is kept confidential. The memorandum is executed and signed by the grantor of the trust under the trust instrument, as well as the trust's formal name and date of origination. It identifies the trustee and any successor trustees with power to act on behalf of the trust. The difference between a declaration of trust and a trust agreement, as designated in the memorandum of trust document, is the grantor's relationship to the trustee. If the trustee and the grantor are the same person and the grantor controls trust assets, the trust falls under a declaration of trust. If the grantor and the trustee are separate people and the trustee controls the trust assets, trust is under a trust agreement . The distinction between a declaration of trust and a trust agreement also affects the name by which the trust takes title to real property as a grantee. In the following example, "John Doe," under a declaration of trust, serves as both grantor and trustee: "John Doe, trustee under declaration of trust dated mm/dd/yyyy." Under a trust agreement, the grantor name is included as well: "John Doe under agreement with Robert Grantor dated mm/dd/yyyy" . All recorded documents relating to real property in the State of New York are required to include a physical description of the property, as well as the section, lot, block, and unit numbers. Neira S. said: No problem with Recorders Office using your document. It is now completed and recorded. Reply from Staff: Thank you Neira, have a wonderful day! Patrick A. said: Real value. Excellent forms, guidance & samples. Included Homestead Exemption form & info are also valuable & greatly appreciated.